Martin Truex Jr. celebrates his fourth Monster Energy NASCAR Cup Series win of 2017 at Watkins Glen International on Aug. 6, 2017 (photo courtesy of Getty Images for NASCAR). 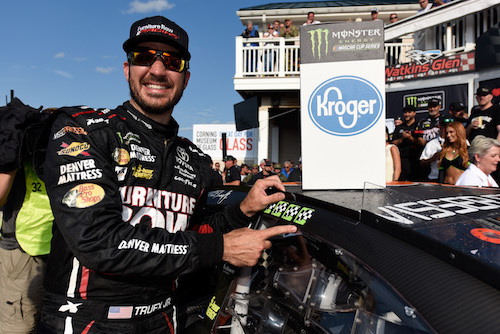 After a stage win and a second-place finish in the Pure Michigan 400 at Michigan International Speedway in Brooklyn on Aug. 13, Martin Truex Jr. is in a position to clinch the Monster Energy NASCAR Cup Series regular-season championship in the Bass Pro Shops NRA Night Race at Bristol (Ten.) Motor Speedway on Saturday night. If Truex has a 121-point lead over the second-place driver in the points standings after Saturday night’s race, he’ll be guaranteed to be the points leader at the end of the regular season that will have two races remaining at Darlington (S.C.) Raceway and Richmond (Va.) Raceway. Truex heads into the Bristol race with a 129-point lead on second-place driver Kyle Larson. Truex has two top-fives and three top-10 finishes in 23-career starts at Bristol Motor Speedway. When the Cup Series raced there earlier this season, he finished eighth after winning the first stage. The regular-season title carries with it a 15 playoff-point bonus. Truex also has a generous playoff-point lead over the competition. He already has 35 bonus points after four race wins and 15 stage wins. The driver with the next-highest tally in playoff points is Larson with 18.